Fake reviews are doing a lot of damage to businesses, services, and lately, ICOs. Reviews have a certain influence on a prospective customer/investor’s purchase/investment decisions. A report from Spiegel Research Center revealed that products or services that have at least five reviews have 270 percent more chances of a purchase. The report, entitled “How Online Reviews Influence Sales,” somehow gives us a glimpse of the status quo in the online world. The power of reviews to push or pull a person from a product isn’t only an issue for businesses and ICOs, but also for customers and investors. Reviews oftentimes deliver false promises of product legitimacy and quality. This causes both disappointment and frustration that are often overshadowed by manipulated reviews – or even outright rejected. Nature of the ICO’s infrastructure and ecosystem. Different ICO projects have different strengths and implementation models so it is best to scrutinize these factors before investing in any ICO crowdfunding activities. Reviews in the Revain blockchain platform are immutable – they can’t be changed or manipulated in any way. No one, especially not the subject of reviews can change or remove the reviews from the platform. Businesses and ICOs can dispute any claims, essentially negating it but this won’t remove the said claim. Immutability is one of the fundamental features of the Revain ICO project. This immutability also enables the Revain blockchain platform to become a true decentralized trustless platform – solidifying the soundness of the project’s premise. Revain aggregates data and statistics about the performance of the ICO and issued tokens. This is a great source of information for prospective investors. It can also help build the market value of ICOs as these vital insights ensure that prospective investors are well-informed about everything they need to know about the ICO. Revain blockchain can provide insights on the two important aspects that determine a project’s post-ICO success. These are documentation and solid business goals. CEOs are often zealous and overestimate the capabilities of their startups so it is important for investors to evaluate the project even before the ICO commences. All of the reviews in the platform goes through a rigid filtration process that is undergone with the help of an AI algorithm. The state-of-the-art IBM Watson platform offers AI systems that can detect anything from spam to user sentiment. The AI uses three general parameters: emotion, language style, and social tendencies in order to determine the legitimacy and appropriateness or a review. Once approved by the system, the reviews undergo another stage of filtration, this time from Revain ICO’s in-house team. The team follows strict guidelines and are free from any external influences. Revain’s approach is to incentivize the review process – encouraging users to be more open and thorough in their reviews. This is done through the utilization of Revain blockchain technology and cryptocurrency. One of the Revain ICO tokens, RVN would be used to facilitate the reward system that would be implemented within this year. Revain ICO does not only authenticate reviews for the benefit of both investors and ICOs but also negate the power of fake reviews and review manipulation. 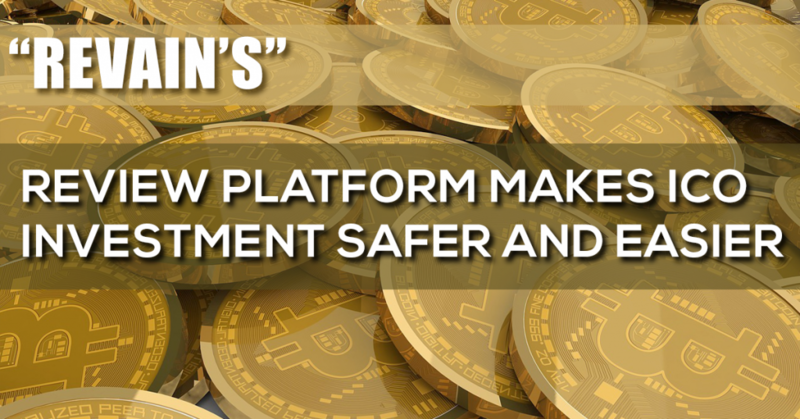 Also, by asking users to express their opinions on important elements of the project, reviews in the Revain blockchain platform can refute any misleading information regarding the projects. ICOs are raising billions of dollars within just a span of a few months. But not all of these investments would yield profits. Revain ICO already noticed a pattern wherein it was revealed that projects leveraging blockchain technology and cryptocurrency to solve common problems become successful. These projects, just like the Revain blockchain platform present solutions that are made possible or made more efficient through blockchain technology. The success of the ICO project isn’t a guarantee of post-ICO success, though. That’s why it is important for investors to identify the project’s issues early on.